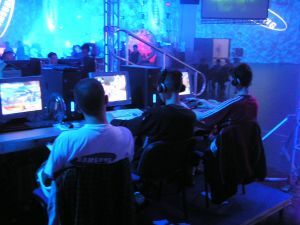 The future of MMO games in the social networking arena, will it happen and how? With the number of MMOs released each month on the rise, what does the future hold in store for the typical PC gamer. This entry will cover the promised future content that has hit the headlines recently and also what new goodies will play a major part in retaining those 5 year veterans or seeking out new blood in the years to come. Only recently SciFi has gone into talks about making an MMO game to generate content for a TV show. OK so it's a little off the wall but thinking of recent advancements in this area, could it be a viable source of continued content? Games like World in Conflict allowed a clan to edit their details either in-game or via their website, using the website also allowed the upload of a banner image. The image is not only shown on their clan page on massgate but also on their clan page in the game. This is a prime example of how companies can tie in a website to the game and vica-versa. In a recent post by the CoX developer Positron, there was mention of user created missions and story arcs. Having the ability to generate maps and storylines (including all the NPC banter) will hopefully be a massive milestone towards the future of MMOs and user generated content. There are many points that I feel should be considered and form the core functionality of such a system. One big point is power-leveling/farming. Now if we imagine that a power-leveling service were to build their own maps with a high level of spawns surely this could cause issues within the balance of the game and it's in-game economy. Points to ponder but I think it's a topic to revisit when there is a definitive process in place for vetting user submitted content. Now considering that MMOs use databases (frequently custom made) to store all the statistics and information about a character and clans, the interaction between these has been on a very small scale so far. Examples of this have been statistics pages that update every X hours, or player information normally seen in signature form generated from XML feeds. Admittedly there have been profile pages that have content generated, but these have been mostly limited to the realm of FPS games where-as MMOs have some areas expanded on like with the WOW amory(sic). But just displaying the information is it enough? With MMOs wanting to cut themselves a bigger slice of the gamer-base, user driven content and linking into websites will be a method to ensure their game stands out from the crowd and keeps the gamers new and old coming back for more. What type of information will you want to see? I'm a data feind and I want all of it, but in the real world this won't be possible so here a few simple ideas that we will perhaps see appearing in the next few years that cover game driven statistics and user generated contributions. Rather than displaying the date you created a character/account, the interesting/saddening information is how much time have you spent in front of the PC levelling. How do you tend to fair? Having some simple information will easily boost popularity in website content. What's better than showing off how your character is progressing? a simple graph showing the last 5 levels you gained and when you obtained them. A simple but informative tool. There is nothing quite like capturing the moment your team got wiped or the time you face-planted into a stream, but sadly only you and maybe a few others will see these images. Having the ability to upload a gallery for your character would certainly give you the opportunity to show off your screenshots. Say you where planning to meet up with some friend to tackle that quest you've been stuck on, but at the last minute you find you have to go out without access to a computer. Jump in the game and hope someone is online to tell? Or could a simpler option be visit the game website and email your friends (selecting them from your friends list) ensuring they all get the message. Simple but effective tools that enhance the overall game integration with the real world. Is the way forward to blur the line between the in-game and out-of-game worlds? Additional functionality that could enhance MMOs is the structured organising of events. A system in place that could allow people to create events and other can indicate if they want to attend. Events could be simple things like clan meetings/help sessions or more advanced plans like raids. Functionality like this could be enhanced with in-game messages and out-of-game game emails to remind players of an upcoming event. As you can see with user orientated functionality existing between games and their websites the possible options in the future are endless. Enhancing games to integrate user-driven content is a big direction for any company to step into but one I hope to see more of in the next few years. Well I think that concludes the second longest (*) post I've ever made on my blog, and if you have read it all, thank you. (*) Admittedly is nothing compared to Stephen Frys Blessays but then I believe I've managed to exhaust my complete vocabulary in one attempt.